Hello, WeAllSew readers! With the holidays fast approaching, stitching out custom embroidery projects moves into full swing! I’m looking for interesting ways to monogram and personalize gift items. Here are a few of the “monogram doodles” I’ve come up with using the fonts built into BERNINA Embroidery Software 7, and some thoughts to get you started on your own personalized embroidery projects. 1. As you begin experimenting with layout options, look at each letter as a graphic element rather than a letter. Refrain from the “need” to align or justify the letter as it is written. Enjoy the geometric nature of the font. 2. Consider mixing fonts for a modern approach to monogramming. 3. Apply the wreath tool or other mirror merge functions to create all-over patterns. 4. Consider adding buttonholes to a monogram to use as a functional closure or to add a pretty bow. This is an elegant detail for personalized chair covers, wine wraps or tote bags. 6. Experiment with fill types on larger letters. 7. Experiment with the placement of the monogram. On a t-shirt, for example, the sleeve, hemline, center back neckline, and shoulder are options that give the finished project contemporary appeal. 8. Always refer to the built-in Reference Manual (Help > Reference Manual) for recommended sizes for each font selected. Not all fonts are suitable for stitching in all sizes. 9. Test the final design before stitching on the project. Save successful leftover test sew-outs to make fabric gift or luggage tags or coffee cup wraps. 10. Add accent pieces such as those shown here from the OESD Crafter’s Collection #21003, Sensational Swirls. As you are embroidering for the holidays, please forward pictures of your projects or work in progress – I’d love to see them. 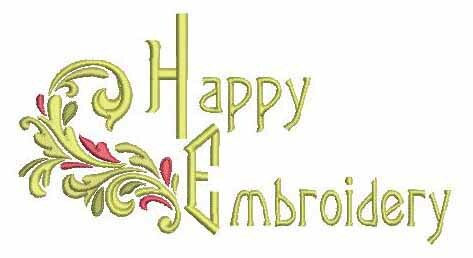 And remember to send your embroidery wishes my way!